This summer I am thrilled to return to my island roots to host my 4th Annual SUP JOga Retreat in Terceira Island, Azores! Prepare to find yourself in the magical lost world of Atlantis. The Azores island archipelago is drop center of the Atlantic ocean and a raw, natural, volcanic land where the ocean meets the sky. Your adventure will be lead by our Azorean born native New Yorker and the BodyRoots NYC and BodyRoots Azores founder, JOana Meneses. Combining the best of her European upbringing and 18 year international movement professional skills, JO will have you connecting your Mind & Body to the flow of the ocean and the undeniable energy of the island’s volcanic rock from head to toe to soul. You decide how your days go down. From daily classes, hikes to the clouds, fresh traditional Azorean cuisine, to plenty of downtime in and around our 4-Star infinity pool/beach front accommodations located in the center of one of UNESCO’s world classified sites, Angra do Heroismo. You will be transported daily for our morning LiquidRoots SUP JOga class. Praia’s Riveira beach is a little private protected cove that will cradle our first floating connection together. The quaint town of Praia da Vitoria boasts cobbled streets, colorful churches, an impressive town hall, modern marina, and beautiful beach (Prainha da Praia da Vitória, meaning Beach of the Victory). While wandering about the town, particularly near the beach, keep your eyes peeled for pieces of the old town wall (erected ~1480). In the evening, experience a breathtaking Volcanic JOga location to connect. Yoga mats, blocks and straps will be provided. 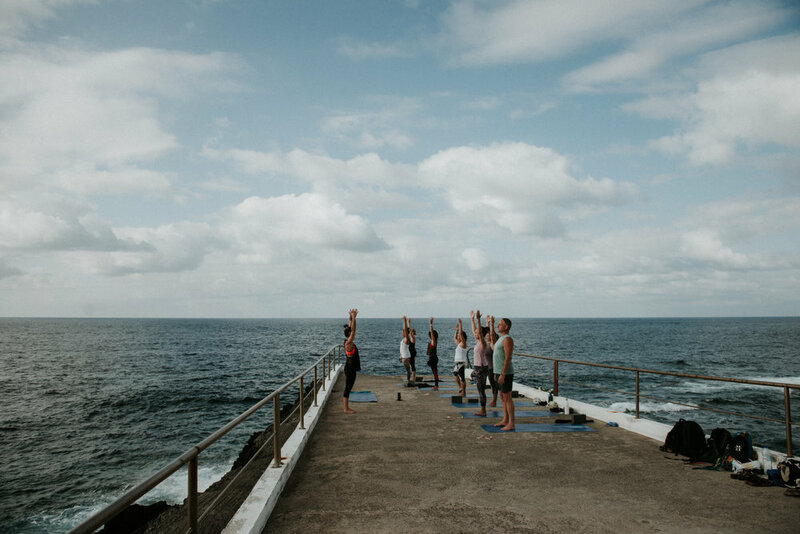 Bring your camera/iPhone and a sweater or towel to cover up for Savasana and prepare for the most epic views the Azores can provide. You’ll stretch and release inside the walls of seaside historic castle (Pousada do Castalinho), at stunning Farrol de Serreta and high atop Mont Brazil. Let the sun/sunset warm your face and the Atlantic Ocean kiss your skin.